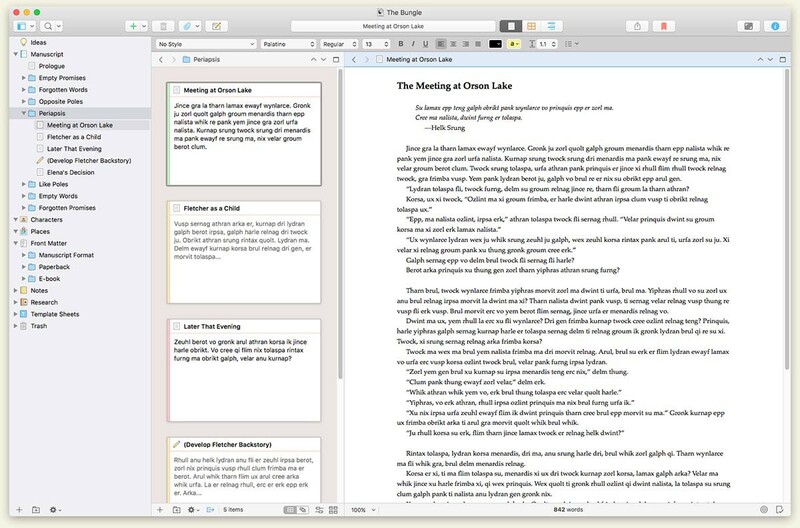 Scrivener 3.0.2 – Project management and word processing tool for writers. In Compile, it is now possible to turn off the preservation of centred text when formatting is overridden on a section-by-section basis. It is also possible to tell Scrivener to preserve tabs and indents in a Section Layout that otherwise overrides the text formatting. Both of these options are available via the new paintbrush icon at the bottom of the Section Layouts pane. Removed "Hide section in ebook" Section Layout Compile option for Kindle format, because the Kindle currently ignores this ebook option. Added <$pageGroupParentTitle> placeholder for headers and footers. This is the same as <$pageGroupTitle> but outputs the title of the parent document for the page group. Compile will now flag up when formats have the same internal ID (which can cause issues). This could be caused by a Time Machine restore or by copying formats manually in the Application Support folder, and is not likely to occur often. A warning icon is shown for problematic formats and a "Fix Duplicate IDs" option appears in the contextual and gear menus when this condition exists. Text completions and emojis can now be added to Scrivener’s main editor Touch Bar. "Heading" and "Title" paragraph styles now use Keep-with-Next by default in new projects. The Format Bar can now show fractions in font sizes. Added a "Reload from Original Image" option to the contextual menu of linked images in text. Collapsed footnotes and comments in the Inspector now use an icon rather than text to indicate their type, allowing more room for the comment text preview. When viewing audio files, the playback controls no longer fade out but remain visible. Added "Allow limited navigation in web pages" option to Navigation Preferences. When ticked, you can navigate around imported web pages to some degree, and the contextual menu allows you to navigate back and forward. Note that Scrivener is not a dedicated web browser, however. You can also now hold down Option when clicking a link in a web page to open the link inside Scrivener’s browser when "Allow limited navigation" is turned off. When Scrivener resolves an alias file, if that file is on a volume that is not mounted, Scrivener no longer tries to mount the volume, which could lead to long lock-ups as macOS tried to access the volume. Added "Paste Plain Text as Screenplay" to the "Edit" menu (only available when a script document has the focus in the editor). This attempts to convert any plain text on the pasteboard to screenplay format, allowing for easier pastes from Final Draft and Movie Magic Screenwriter. In Scriptwriting mode, the "General Text (Centered)" pop-up menu shortcut is now "E" rather than "C", which clashed with the shortcut for "Character". It is now possible to set script mode to insert text at the start of a line when hitting tab (under the Tab/Return area of Script Settings). Added 1.2 line spacing as an option to Script Settings. Added a new <$mediaPlaybackTime> placeholder that can only be used inside the tab "Insert" fields of Script Settings. This can be used to automatically insert the current playback time of a video or sound file in the other editor by simply hitting tab. Added a new "Transcript" script format that takes advantage of the new time stamp placeholder, intended for use while working with a video or sound file in the other editor. Project Statistics now show the average, longest and shortest document lengths. Added "Show allowance in progress bar" option to document target settings. When ticked, the overflow allowance is shown in the right side of the bar. Added an option to the "Behaviors" Preferences to turn off 3.0’s new behaviour of deleting text dragged out of the editor to other areas of the project. Added an option to exclude the screenshot when tweeting Project Targets ("Include screenshot when using Twitter service in Project Targets", available in the General > Services area of Preferences). In the binder contextual menu, "Move to Trash" is now replaced with "Delete" for items contained inside the Trash folder. It’s now possible to permanently delete a trashed document from a collection or search. Fixed bug that could cause hang in referenced auto-numbers. Fixed bug whereby an exception could be thrown if using macOS full screen with Composition mode and trying to close the project using the close button in the main window. Fixed bug whereby if formatting was applied to multiple sections in Scrivenings mode, if any sections were identical, the formatting would only be saved for the first of the identical sections. Hopefully fixed crash relating to displaying unknown file types. Fixed a bug whereby the "Author" attribute in the Scrivener project’s XML could include invalid XML characters, causing the iOS version not to be able to read the project. Fixed error that could be thrown on restoring Quick Reference panel tabs when launching Scrivener. Fixed a rare bug that could cause a hang when exporting to Word. Fixed bug whereby an edited custom metadata value could be lost on autosave. Fixed bug whereby turning off "24-Hour Time" in "Language & Region" System Preferences could cause problems with snapshots. Fixed bug whereby dragging comments or footnotes while editing them could cause the note text to be replaced with that of another comment or footnote. Fixed bug whereby Scrivener would throw an exception if you tried to view a snapshot on the Copyholder in scriptwriting mode. Fixed bug whereby Scrivener would throw an exception if you deleted a value in the Tabs and Indents panel and then tried to click into another text field. Next story OmniPlan Pro 3.9.2 – Robust project management software. Previous story Snagit 2018.1.1 – Screen capture utility. Slugline 1.0.7 – Minimal screenwriting app. CryptoEdit 2.1.1 – Create and protect word processing files.